Big decisions can leave us stuck or unnecessarily stressed for far too long if we don’t know how to handle them in the right way. I’m so excited to share a decision making tool with you that has worked for me and others over the years and brought a lot of relief, clarity, and forward movement into our lives. In this episode I’m going to discuss indecision in depth and share examples of how to get through it and not let it slow your roll. I am specifically referring to BIG decisions here… the tough ones like whether to quit a job, end your marriage, or stop trying to have children. Situations like these really get our brains stuck, and I want to show you how to get into a more solutions-focused mindset. I also discuss real situations where this has applied and worked, as well as some powerful questions you should be asking yourself in order to make a decision you won’t regret. Why indecision is an indulgence that we need to avoid. How this decision making tool presented itself to me. The importance of knowing you can take TIME to make a decision. Why making a decision can be so difficult. When it’s important to REQUIRE yourself to make a decision. The value of keeping momentum and MOVING forward. How to get your brain into a solutions-focused place. Powerful questions you should be asking yourself. 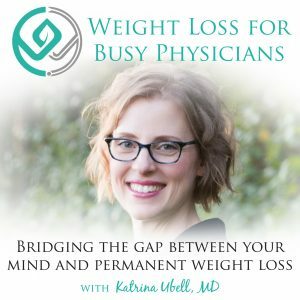 Katrina Ubell: You are listening to the Weight Loss for Busy Physicians podcast with Katrina Ubell, MD, episode #72. 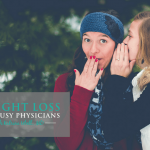 Welcome to Weight Loss for Busy Physicians, the podcast where busy doctors like you get the practically solutions and support you need to permanently lose the weight so you can feel better and have the life you want. If you’re looking to overcome your stress eating and exhaustion, and move into freedom around food, you’re in the right place. Well hey there, my friend. Thank you so much for joining me today on the podcast. I am so excited to talk to you today about what we’re going to talk about. Super, super fun. I think it’s just such a great tool. I haven’t shared it with you. I think it’s really going to change everything for some of you, so I can’t wait for you to listen in. Listen, before we get started, I wanted to let you know that I finally reached my goal of 500 iTunes reviews. Thanks to all of you. Thank you, thank you, thank you so much. It was a while ago. I didn’t even go back and actually looked when I first started asking you guys, but I had set his goal to get 500 iTunes reviews and you all did not disappoint. Thank you so much for all your reviews, your ratings, and especially for your patience as I continually asked you every week and in all my emails if you would do that for me. Regardless, it was still so fun to share the reviews because every week when I got ready for this podcast, I’d go into iTunes and see what you guys had all been writing recently, and it was so fun to share in your successes and to share in your excitement as you have been applying this material and really getting great results for yourself. It just makes me so happy for you. All I do is record this podcast and you guys do the hard work and actually apply it, and completely change your lives. I mean, what could be better? So amazing. So happy for all of you. Again, thank you so much from the bottom of my heart. I really, really appreciate it. Hopefully I won’t get the idea of a bee in my bonnet, whatever, get excited about the idea of 1,000 reviews any time soon, right? Maybe you guys can just keep offering me some iTunes reviews as you go along and it’ll just get there eventually on its own. That would be a deal, wouldn’t it? Okay, today I want to talk to you about a way to make decisions. This isn’t like little decisions; this is really more a tool for when you have a really big decision up ahead of you that seems hard or overwhelming, or really scary. It just seems like a really big deal. We’re making decisions, of course, every single day, all the time. Tons and tons of decisions all the time, but then there’s sometimes big decisions about our lives that can be really, really difficult. We really can end up indulging in indecision. Like I said, I’m not talking about what to eat for lunch, which you should’ve planned the night before anyway, so it shouldn’t even be what we’re talking about. What I’m talking about is more “should I switch jobs or not?” “Should I move across the country or not for this new job or to be closer to family?” “Should I uproot my children, my whole entire family?” “Should I stay in this marriage or not?” “Should I start trying to have children or not?” “Should I stop trying to have children or not?” “Should I apply for this grant or this promotion or not?” Really big life decisions that it’s really easy to just get stuck in. We just spin around in indecision and not make any progress. For those of you who’ve been with me from the beginning, you remember that indecision is one of the indulgent emotions. For sure in this kind of thing, you’re indulging in indecision but you’re also indulging in confusion, indulging often in overwhelm, and indulging also in doubt. You don’t feel confident in yourself to make the right decision, so you’re doubting your decision either way. I want to share this strategy, this tool that I came up with years ago. It really was just something that came to me. I don’t know, just kind of like lighting bolt to the brain. What happened was, many years ago I was in practice and a family of mine came in. As these things go, right? We’ve all had these experiences where you think it’s just going to be a quick whatever check, eczema or a checkup or something like that, and the parents drop some really big news on you. In order to protect this family’s privacy, I’m not going to tell you specifically what happened, but this mom told me about what she was going through in her marriage. She had gotten some significant information about her husband, and she was really in a place where she did not know how to handle it. She didn’t know if she wanted to stay in the marriage or not. She felt really, really conflicted. That helped her in the moment. She was like, “Oh yeah, okay. That’s interesting. Okay.” They left, and the child was already older and school-aged, and so they didn’t come in very often. I think it was over a year later, maybe even two years later she came back in. I hadn’t heard word one. I didn’t know what was going on with them, so what she told me, she literally said to me, “I have to tell you, you gave me the best advice out of any person that I consulted about this whole thing.” At this point, I’m like, “Great. What did I say? I have no recollection.” I didn’t think when I was telling her that that this was so insightful or anything like that. She said, “You told me that maybe what I should do is decide to not decide. That was the absolute best thing I could do. Once I took that pressure off of myself to make a decision, I really could think about what I wanted. I decided to stay with him.” I was like, “That’s fantastic. I’m so happy for you.” She’s like, “We’ve been working on all this stuff,” whatever. Anyway, she was very, very pleased in that decision. Then interestingly, fast forward even a couple more years. What ended up happening was unfortunately, her husband contracted, not “contracted.” It sounds like an infectious disease. He developed a very rare, very fatal cancer at a very young age. It took him within three months. He was gone very, very quickly. During that time, of course, I was more involved with them and supporting her and supporting their child and all of that. She just kept telling me how glad she was that she had given herself time to make the decision because had she listened to everyone else, she would’ve left him. She was so, so glad that she’d stayed and that now, she could be the person to be there with him as he went through this really difficult illness and then ultimately passing away. I have applied this to myself, too, at times. There have been many times, like for instance when I was trying to decide whether I should leave my practice or not, where I let myself open the door to possibilities by deciding to stop thinking about something a certain way. Not thinking that it had to be that way. Just saying, “Okay, I’m just going to decide to not decide about this right now. I’m going to give myself all of the options, let them just simmer in my brain, and I know that the right decision will come to me.” That’s basically how I ended up making the decision to walk away from a very, very successful, very lucrative, I mean “you’d be crazy to leave this job” kind of a job, and create something totally new in my life. We often really feel this self-imposed pressure to make the decision quickly, or we might feel pressured by others. In the story of that family of mine, this woman really felt a lot of pressure from all these outside sources. In your case, maybe your spouse really wants to start trying to have a baby but you aren’t sure yet, or maybe the flip side: you’ve been really trying to have a baby, and your spouse really wants to stop but you’re just not sure if you’re ready to let go of that dream yet. Maybe your boss really wants you to apply for some sort of grant or some sort of leadership position that’s opened up, and you just aren’t sure if it’s a good idea for you or you family, or if it’s even just something you want to do at all. Sometimes we just don’t want to do it, and that’s okay. Or, like with my patient, right? Your therapist and friends might all be telling you to leave your husband, and you just are not ready to pull the trigger yet. “Pulling the trigger” figuratively, of course, not literally. You might have been talking forever with everyone who’ll listen about how you aren’t happy at your job, but then you find something new and you get a new offer, and now you aren’t sure that this new offer is really what you want either, and you’re just in indecision. You are requiring yourself to move forward now and take action. You choose your eating plan, you make a decision, and you move forward. In this case, do not decide to not decide. If they all seem equally good, then choose on and just move forward with it, and then don’t look back and think, “Oh, maybe that one would’ve been better.” This is exactly what I did when we switched schools for my kids, because I decided right away, “We’re going to make this transition and I’m never going to look back and say, ‘That was the wrong decision.’ I’m not going to go back and let myself think about the old school and the things that I liked better about it, and tell myself that ‘that was really better’ and ‘maybe we shouldn’t have done it.’ Even if this new decision is a disaster, then the way I will look at it is that I learned a ton, we all learned a ton, and then we made another decision that moved us forward.” Keeping that future focus, continuing to move forward in live, and not allowing myself to go back and spend time in the past thinking that I should’ve done something differently because the past is done, right? It can’t be changed. No sense in spending time there at all. Now let’s transition to when the decision feels really, really hard, or it’s that really, really big decision when you might want to use this tool. The reason this tool can be so helpful and the reason why some of these decisions can feel so hard and so debilitating is because your brain is blocked. It’s not in a solutions-focused place. You might be looking at the situation as though it’s very black or white, like, “I have this option or this option. I can apply for this leadership role, or I can just stay put and do the same thing that I’ve always done.” “I can decide to stop trying to carry my own baby or live a childless life.” “I can leave my husband or stay and be miserable the rest of my life.” Every time you go to make the decision, you go to make that choice, it’s kind of like you’re chewing glass, right? You’re just like, “Ugh, I just don’t know.” You probably have some competing desires, too. Maybe you want to stop trying to have a baby, but gosh, you still really want a baby. You feel really stuck because you think there’s just those two options. When I was unhappy in my job, that’s exactly what I did. I asked my brain to just lay me out every single option I could think of of what I could do. In doing so is when, it literally was like the idea of leaving my practice, it popped up into my head and then it was like I responded to that like, “I could do that? Really? Could I do that?” Like I had never, ever considered it once. Once that door opened, it became within a couple weeks so obvious. “Oh, see that is the solution that I’ve been looking for. I just had no idea.” When you’re asking yourself really powerful questions, questions that help you to get what you want, not keep you stuck where you are, that is how you start being able to be in that position of being able to finalize that decision. Sometimes this happens very quickly. I feel like for me with my job, it happened very quickly, and then sometimes it takes longer. It’s totally fine either way. What you’re doing is you’re looking internally for the answer rather than looking externally, when we’re asking lots of people’s opinions. They always say the more people you ask for their opinion, the more opinions you get. Then you have all these opinions, you’re trying to assimilate them, but, “She thinks this and he thinks that. What am I supposed to do?” You know the right answer when you’ve actually moved inside. It’s the same thing that I teach my weight loss clients. You do not need to follow somebody else’s eating plan; you can create your own, obviously with some guidance, but that’s going to be the ideal plan for you because you created it for you and your life. Nobody else knows that information. Now sometimes, the best decision feels terrible. Don’t expect it to look like rainbows and daisies. Also, our brains often really, really want us to know exactly what’s going to happen and how things are going to go before we feel comfortable making a decision. When that happens, what we’re desperate for is the “how.” I also see this all the time with my weight loss clients. “I want to know how I’m going to reach my goal weight. I want to know exactly the path.” Nobody knows exactly the path. Maybe you’ll start eating this way, and that’s all you’re going to need to do and you’ll get your goal. Maybe not. You might need to change it 10 times. There’s no way we can anticipate that now. The way you’re going to know “how” is once you get there. Then you’re going to be able to look back and go, “Oh, that was how.” The “how” will not be available to you now. Wanting to know the “how” in advance is basically asking for a guarantee that you can the result that you want, and you’re just not going to find that. You’re not going to find that guarantee, but when you believe in yourself and your ability to take action, and your ability to reevaluate and get information that you need, then you really can believe in the ability to create anything that you want. You can apply this tool to any of the examples I gave, or any other really major decision that you’re struggling with. Consider using this tool, “deciding to not decide,” if you’re just going around and around and aren’t moving anywhere. You can take a break from deciding. Make the decision that you’re not going to be deciding right now, and then you choose powerful questions to ask yourself so that you can start looking at the situation in a new light. Finding new solutions, new opportunities within the problem that you hadn’t realized before. Taking that pressure off of yourself can really be the way that you move out of all those indulgent emotions of overwhelm, indecision, confusion, and doubt, and into taking action toward the result that you want in your life. All right, can’t wait to hear what you think about this. Remember, you can always leave me comments or ask me any questions on the show notes pages for these episodes, which you can find at katrinaubellmd.com/72 for this episode. Have a wonderful, wonderful week, and I will talk to you next time. Take care. Bye-bye. Thanks for joining me today. If you like what you heard here, be sure to hit “subscribe” in your podcast app so you never miss an episode. You can also get “My Busy Doctor’s Quick Start Guide to Effective Weight Loss for Free” by visiting me over at katrinaubellmd.com.